Elizabeth “Betty” Marguerite (Weniger) Jackson, 91, of Honesdale, died on Saturday, Marc 23, 2019 at her daughters home in Bethany. She was preceded in death by her husband, Walter C. Jackson on March 24, 1998. The couple married on June 30, 1949. Born on November 11, 1927 in Honesdale, she was the daughter and last surviving member of the Charles J. and Mary E. (O’Brien) Weniger family. She was a graduate of Honesdale Catholic High School and in 1948 received her nursing degree from Mercy Hospital. For 40 years, she was a nurse at Wayne Memorial Hospital and a private duty nurse before retiring. She was well known to sing or hum to her patients while caring for them. Betty was a member of the Retired Nurses Association and the Private Duty Nurses Association. 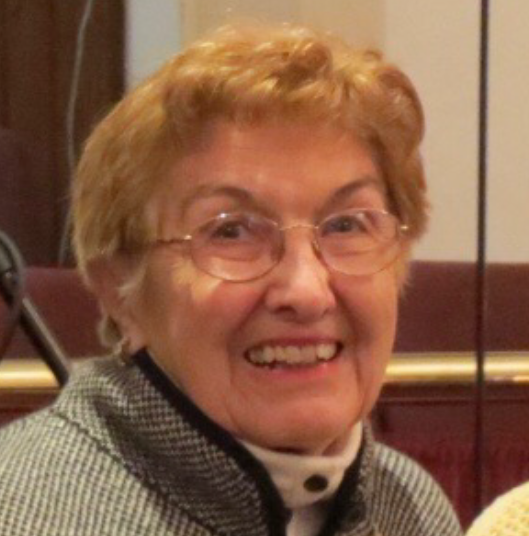 She was also a faithful member of St. John the Evangelist Parish in Honesdale and it’s Altar and Rosary Society. She was an original participant in the Perpetual Eucharistic Adoration Chapel and a member of the Catholic Daughters of the America’s Court St. Martin # 418. Betty loved her family and the time spent together. She started a family Easter Egg Hunt tradition that has occurred the past 40 Easters. She also enjoyed her time with friends and the “breakfast club” that would meet following the 7:30 Mass. Surviving are her children, Diane McElroy and husband Lynn of Honesdale, Sue Gillow and husband Dale of Bethany, Nancy O’Connell and husband Jim of Honesdale, Betsy Ciaston and husband Joe of Hamlin and Tom Jackson and wife Karen of Honesdale; sisters-in-law Marie Jean Weniger of Bethany and Carolyn Bond and husband Jim of South Carolina. Also her grandchildren Sean McElroy and wife Cathy, Amy McElroy, Eric McElroy and wife Jennifer, Stephanie Ordnung and husband Mark, Brian Gillow and wife Chris, Lori Thompson, Lisa LaBruno and husband Joe, Jake Thompson and wife Alisha, Jesse O’Connell, Jason O’Connell, Kristi English and husband Michael, Kelli Jackson, TJ Jackson and Timmy Jackson; great grandchildren Justin, Carly, Hailey, Lucas, Shane, Katelynn, Corey, Dylan, Matthew, Adrianne, Olivia, Calum, Weston, Travis and wife Lindsey, Matia, Addison, Max, Brinley and Benson; many nieces and nephews, cousins Christina Enslin and Eileen Kennedy and many other cousins. She was preceded in death by her great grandson Christopher Ordnung on December 21, 1998; a sister Esther M. Weniger; brothers Donald F. Weniger, J. Bernard “Bud” Weniger and Gerald J. Weniger; infant siblings Dorothy and Charles. A Mass of Christian Burial will be celebrated on Friday, March 29th at St. Mary Magdalen Church, Honesdale at 10 am. Interment will follow in St. Mary’s Cemetery. Friends may visit Hessling Funeral Home, Inc., 428 Main St. Honesdale on Thursday, 4 to 7. Memorial contributions can be made to Catholic Daughters of the Americas, Court St. Martin # 418 or to St. John the Evangelist Parish, Eucharistic Adoration Chapel. Both can be sent to St. John the Evangelist Parish, 414 Church St. Honesdale, PA 18431.